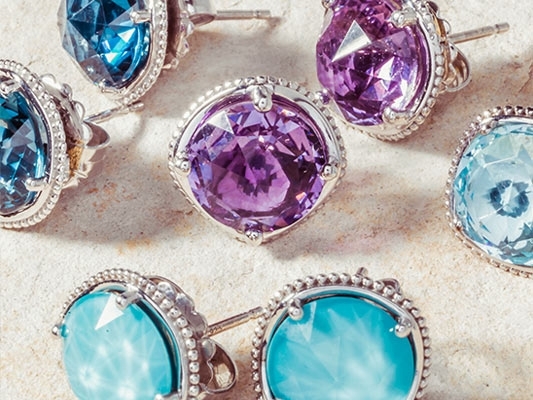 Tacori earrings are effortlessly stylish, bringing a touch of class to every outfit. From studs to drops and everything in-between, they are an unparalleled choice, instantly completing any look. For a touch of rockstar glamour, inky black onyx is the star attraction in earrings from the City Lights collection. Choose between a pair of drop earrings with either a solitary stone or a cluster of green onyx stones for earrings that’ll make a statement. The earrings in the Tacori Crescent collection are classically beautiful, with sparkling white diamonds set in bright sterling silver. These earrings are an affordable blend of classic style with a hint of modernity, with simple studs featuring sunny lemon and smoky quartz, and drop earrings in an on-trend ombré color scheme. The Affleuress collection of chandelier earrings feature 18 karat yellow gold and sparkling white diamonds for a gorgeous vintage-inspired look that stands out from the crowd. For a unique spin on traditional hoops, look no further than Tacori’s 10mm hoops that combine intricately designed sterling silver with bright neolite turquoise or muted blue topaz.